One of the key features necessary for a seasteading concept is its “unlimited extensibility” it needs to grow on the watersurface just like a land based City grows into the surrounding fields. This is a key feature as growth is necessary to assure the future development of the floating city. Growth in a triangular ramform bow concept is taking place in the arms. It has been mentioned that the arms need to have a train configuration. This configuration allows to add pieces as the development of the City requires more and more space. Modularity has been discussed in other threads in the context of LEGO style snap fit sistems and tiling concepts that have some kind of “connectors” (train knockles have been discussed in earlier discussions). But at the end nothing is better than the things used in the marine industry today. Connections do not need to be re invented, they are all around us and in dayly use - rope and tires give flexibility any boat owner knows how to use them to create the kind of connections that allow the required properties of movement and connection. If you think of a matrix printing process you find that each droplet of the building material delivered by the printer is “connected to earlier droplets” by adhesion without the need of connectors or bolts that bolt the modules together to a solid piece. In some way matrix printing is modular building - making the modules small (drop size) and skipping the connectors - so compared to LEGO it is much more sophisticated easier and universal. It keeps the infinite expandability of the building process which is the good thing and avoids connectors which is the bad thing. Matrix Printing has a model in nature where cells (modules) come together to build something much bigger. A 200 ton whale body can be created in a continuous growth process from a single microsopic cell. In one of our building processes we have a sistem of shoe box sized cells that can be added without the use of connectors in all directions in a freeforming process. If you google it up | Search Term : “floating light honeycomb cement composite construction” | you can find examples how this applies for floating cities . It allows light shell structures, truss structures, in any shape and weight class you can imagine. This kind of structures are not “code conform” we therefore don´t see them frequently in our land cities - a floating city operates in a code free space - seasteading is not only a door-opener for new politics - it is also an accelerator for new technology. 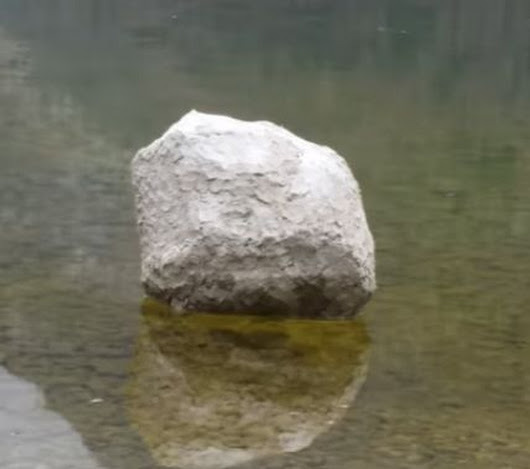 To get a general idea how light and high in the water that kind of structures float watch the video of a small test piece floating on the water surface. Due to the cement binder in the composite structure you have the optical apperance of a rock . You also get the UV light resistance and the corrosion resistance of rock (concrete). Which points at a service livespan of 200 years and a life expectance of more than 2000 years. But you can build it to a very different weight which becomes obvious when you watch the flotation line in the video above. How light you can build it depends rather on the skills of the builder than the properties of the material. Nature has perfected this way of making light and tough structures for the marine ambient for millions of years. For human engineering this is a relative new field that goes way beyond the building of concrete columns and slabs in a simple cast process . What we developed in the oceanic business alliance is a process that mimiks biology we have construction methods that allow to add ultralight building cells in any direction at any time to a existing structure. So the structure becomes like a living organism it can grow almost inperceptible cell by cell while life and business goes on. What we are used to in engineering that there is a construction phase and then people and business move into the finished building becomes completly obsolete. Our seasteads will grow for ever in the way and rithm life in them requires it. You can imagine our floating city almost like a termite nest2 - people live in it - repair it and expand it all the time. If a Draupner wave breaks the structure in two pieces each of the pieces floats like a foamblock . We are more in the business of “developing revolutionary construction technologies” that solve the technology bottleneck of seasteading than into the “politics of seasteading” this is where our project differs most from other projects mentioned here. We figure out how to build New-Venice and New-Atlantis, we already have built the test pieces2 that do the convincing and are in the process to have the phase 1 conversation with visionary investors who are willing to join our project. Unlike land buildings this structure can survive Draupner impacts, built from the materials in the video above it is absolute unsinkable. This is a slight variation to the structure in the picture above it is a “bubble cluster structure” using room sized cells rather than truss construction. Again here the structure is reasonably Draupner impact safe, can grow room for room, new rooms can be added at any time in any direction. The load distribution is similar to a foamblock and does not depend on load bearing colums and beams. It is no coincidence that Matias Volco has studied at the class of Zaha Hadid. Architecture has become Sculpture, and the code free ambient of a floating city is exactly what is needed to get light cement composite building technology to its full bloom. So New-VENICE and New-Atlantis far from being land buildings floated out on some kind of concrete barge will take construction and architecture an evolutionary step further we will finally step up to the building art that nature has developed millions of years before humans. So when the question what happened to “modular building” is answered with “it evolved” - that is EXACTLY it. To be clear, modular building is not dismissed out of hand. It just became clear that expansion does not require modular building. That would be a “concept error” modular building is just one among many options to have expansability. Connectors are not the only solution. Thinking beyond modularity and connectors is worth it. Incredible light and tough structures can be built in advanced cement composite technology - the material is free of corrosion lasts for ever in marine ambient what forms a solid base for oceanic real estate and the big real estate shift . In the Oceanic Aquaculture3 thread it was also mentioned that those advanced cement composites can be built EXACTLY weight neutral in sea water what makes this ideal for building fish cages for the comming age of aquaculture in the open ocean. Termites dot printing their structure - it is a dot of material placed by a termite a time, the building grows for ever in a continous process as the colony requires it. Their buildings exceed ours in both - size (body building relation) and structural toughness by far. If you want so the ball of material that the termite on the left has in its jaw is a “module of some kind” but it is certainly not connected to the other dots with “connectors”. Equally the ball of material you see floating in the water in the video1 is a “construction module” but it will not be “screwed to the building” either it is a integrated and ongoing composite dot printing build. Bubble cluster structure combining truss and shell technology. our lead Architect Matias Volco actually studied at Zaha Hadid in London so i think we are on the safe side when it comes to implement Zaha Hadid visions correctly - thanks for your concern… we discuss that kind of matters in our engineering and structural design boards all the time. • With the advanced composite technology we have at hand (and tested) the visions of grand dame Zaha can be easyly implemented in the watermantle of the planet. Spheres to a maximum 1000m water depth - ocean sphere concept. Tubular to a maximum of 500m water depth - tunnels, hyperloop, torus, spar, etc. structures. Some 20 floors are possible - but highrise in general is not necessary as the primary need for highrise the exorbitant cost of building space in city centers is rendered NULL in floating construction. To get a “competent vision” what is possible feasible and recommended by people who understand both cutting edge architecture and the specific possibilities of our advanced cement composite technologies have a look here for an overview of the frame of possibilities. • We can settle the ocean not only on the surface but all the way down to average ocean depth with the materials we have at hand today. | That is a tremendous amount of VOLUME that becomes available for humans . Exactly the space reserve to develop we need before taking off to space colonization. • In the planetary waterspace high rise is somehow INVERTED | why would you go a mile high if you can go a mile deep or a squaremile wide on the empty ocean surface much easier. The interresting point in osteoblasts is that they keep bones growing according to the stress they are experimenting. If the bone is in overload some of those microstructures start breaking - osteoblasts detect that “microfractures” , repair them and double them up. So you get a bone structure that is reforced EXACTLY where load bearing capacity is needed. I assume at Zaha Hadid Architects finite element computer programs are used to solve such complex structures. - Interrestingly osteoblasts get similar results just by detecting stress repair and double up. In the context of forming big continuous structures in freeforming that can be expanded without modules and connectors - what is happening in the universe of projected concrete2 is worth to be mentioned. The methods that create the underwater tunnels and swimming pools of today lead naturally to the methods that create the floating cities of New-VENICE and New-Atlantis of tomorrow. In the Oceanic Business Alliance we believe in the “natural evolution” of things. What will be here and big tomorrow is already under development in some special niches today… Those of the audience who have followed my discourse over the years know that among our technology pilot projects are fully functional submarines built from advanced cement composites. So it is reasonable to accept the working theory that building a “floating island” is a relative simple task for our group. The legacy of Zaha Hadid is in inviting us to “think beyond the box”… and coded engineering. In the context of “projected concrete and advanced composites” you should also have a look on what was published by @Elwar back in 2015 in this thread especially the last video shows how a “surface film” can “vastly change” the overall property of a piece. You can take a surface film as a “fiber component” introduced at the end of the build… The fiber component in a composite does not have to be mixed in - it can be performed in layers and independent of the cement and the filler components. • When combining 2 materials right you can make a watertank out of a cardbox … it is not about the specifics of materials - it is about the surprising properties that emerge if you COMBINE them. • In advanced composite materials it is not about the material per se it is about the Builder getting it right. • Building in advanced composite materials is rather an artform that requires a deep understanding and know how from the builders … so building logistics is one of the reasons why we don´t see it implemented frequently on large scale already. - The other reason is “pre-coded construction ambients” that exclude new things by default as non-code-conform. It is the code free ambient of seasteads that allow “free choice of options” that will liberate the power of those technologies on larger scale. Consider it rather the consistance of a 7 cm sheet of ice - a man can step on it… and don´t get me wrong the above examples are not my “suggestion how to build a seastead” they are examples for how in composite materials new properties emerge by combining 2 (or more materials) - and how these new properties can be VERY DIFFERENT from the properties one of the materials has on its own without combination. It is not about poly-urea or carbon fiber - or basalt - or geopolymer - to choose above everything else - it is not a “either or” it is a “all together” - there are literally hundreds of materials that can be combined to composite materials with surprising properties - just look at the floating rock in the video above. Finite Element programs allow to get a clear picture where in a complicated truss structure the stress is biggest (red part) and building in composite material, allows to enforce on the exactly right spot, with the right component ( compression, tension, or torsion stresses ) increasing the fiber or the cement component on structural demand. This is again an example how new technologies work together to create something new - a new style of building for new ambients. We are learning to apply the tricks of the termites and the osteoblasts. That makes building logistically more complicated and demands a better understanding from the architect and the builder. The things you can do are more or less limitless and only restricted by the power of imagination of the builder. Here in Colombia for example we have a material called Guadua . In your country they call it Bamboo. People make rafts out of it - imagine it in combination whith sprayed polyurea sheets and the light rock material in the video above - it is quite obvious that you can do a lot of interesting things with that, when it comes to working on the watersurface, and make a first construction layer on it. Althogh these natural segmented tubes have at least the toughness and strength of a similar sized aluminium tube - they are obviously not “code conform”. Do i now suggest to make a seastead out of bamboo ? Not really - but what the example does is showing that your selection and cost of materials you can consider to use in your composite structures also widley depends on your local supply situation . ( Guadua costs next to nothing here ) While you would consider a ice sheet as first construction layer in Canada (Habakkuk ice ship), you will consider a bamboo composite in the tropics. In the “poor man´s floating island - project” we took a somewhat different approach of combining materials to a floating island of “lowest possible cost”, to give poor people floating homes in the floodplaines of the Magdalena river (Government investigation project). This approach depends on a form of “material supply” that is “non code conform” in your country, but very doable in other parts of the world from India to South America. @ted | … our private chat is over here… on the ( ted-wil ) forum. A good example how you can use the fiber component in form of steel rod to create the shape in freeforming. The floating cities of the future will be built from materials (advanced cement composites) that allow to go much beyond what we see today.